By now some of you may be wondering how the aquaponics systems are doing. 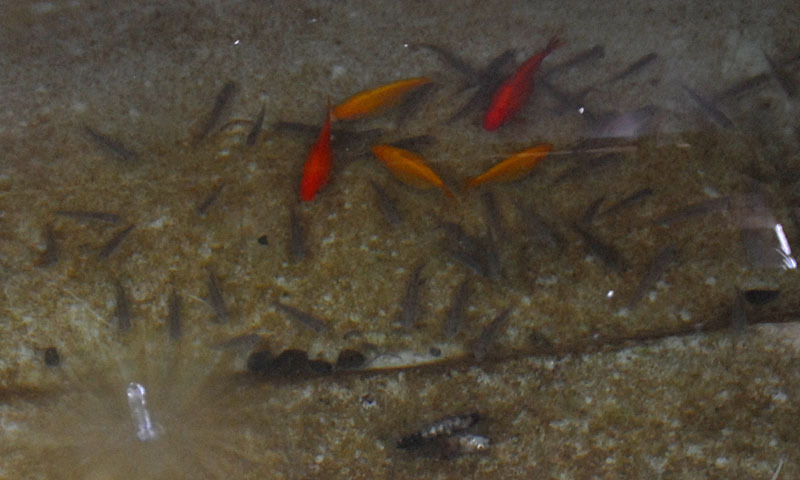 It’s winter, aquaponics and cold temperatures do not go well together, plants don’t grow, fish don’t grow and if it gets too cold the nitrogen fixing bacteria die. Commercial aquaponics systems (and aquaculture and hydroponics systems) are designed to run at temperatures usually between 20 and 25 degrees Celsius. Green houses and heating or cooling systems are used to maintain optimum growth conditions for both the fish and plants. So how are things in the West of Ireland? Autumn started with the coolest September in 14 years followed by the coolest October in 15 years, although November was warmer than average December was back to cold, the coldest 12 years with 18 to 25 ground frosts compared to 13 to 17 normally nationwide. (for more details visit Met Éireann). 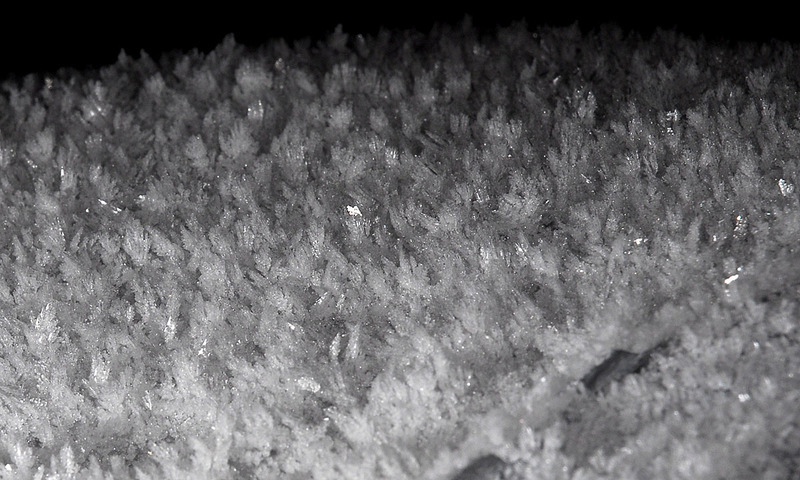 For the first couple of weeks of 2009 there were frosts almost every day. Not ideal conditions for an aquaponics system! 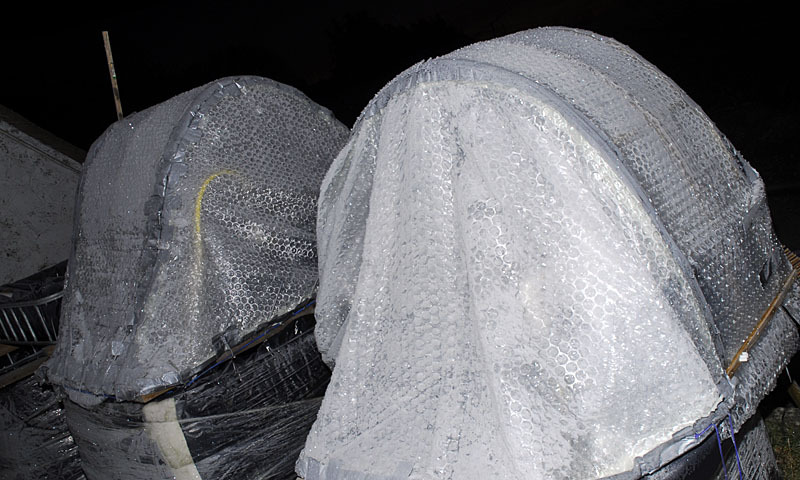 In a bid to stave off the worst that winter had to offer we lagged the fish tanks with rockwool insulation wrapped in plastic and the grow beds now look like lunar modules having been wrapped in two layers of bubble wrap. 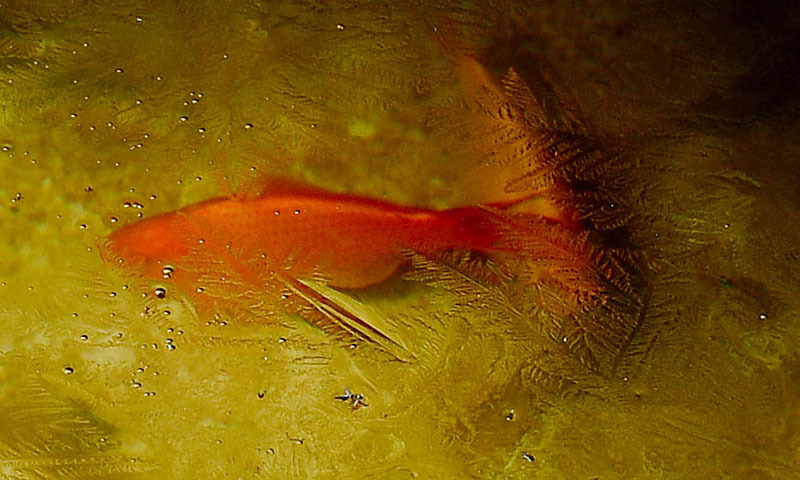 It wasn’t enough, a couple of weeks ago the water in the fish tanks froze over. The fish are still fine though moving under ice, through water (I feel a Kate Bush moment coming on) and there are some of the hardier plants sown which are holding up well. After several weeks of negligence (I was in Australia and got to meet up with the team at the Backyard Aquaponics (BYAP) shop in Perth, more about this in a later post) I finally cleaned out the last of the summer crops from the grow beds; yes that is pak choy in January. Pak choy suffering from a fair bit of frost damage I must admit but if you were operating a system in a green house you would still be getting good produce well into winter. Assuming it doesn’t get cold enough to freeze ALL the water and kill off our fish, everything should be ready to kick off again in the spring. That is of course assuming that the frost hasn’t killed off all our friendly bacteria. If it has then we may be waiting, yet again, for the system to bed in and if the fish get too hungry in the mean time then the spike in ammonia levels could kill them. But the team at BYAP tell me that naturally populated colonies of bacteria are hardier than those in the lab, let’s hope they’re right. This entry was posted on Friday, January 23rd, 2009 at 1:43 pm. 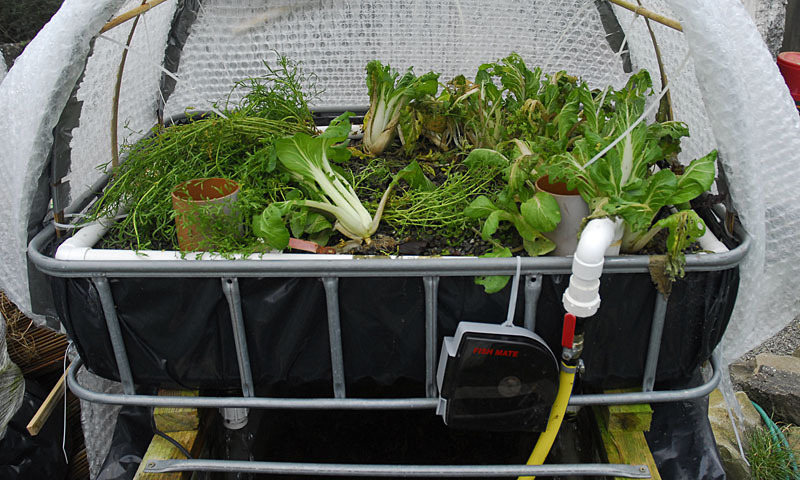 It is filed under About the Aquaponics and tagged with About the Aquaponics, fish, pak choy. You can follow any responses to this entry through the RSS 2.0 feed. Call me old fashioned but I always thought putting a rubber ball in the top and taking it out after the frost was a good idea. Being an antipodean I must admit that these conditions are a bit new to me. P.S. Do you know of others in ireland doing experimenting with aquaponics ? Hi Colm and thanks for your comment. We don’t know of anyone else experimenting with aquaponics here but have come across some people in the UK. We’ll be blogging an update on the setup shortly and hope that in the new year we’ll be putting together a larger version. I’m really intrested in this.currently abroad but just getting started on research.Is teagasc or any other state enterpise bord doing research on the commercial viability of this? Not as far as we know, Gerry.. we are looking into funding ourselves and pursuing production on a larger scale in the coming year. 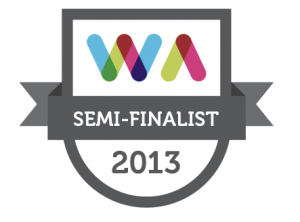 Keep an eye here for updates…. i just done the tour today.it is a very simple system to set up and with the right planning a very effiecient system with low energy costs. basically the most key componet is market research to grow the right produce both fish and plants that gives you the best return for the investment. how are you doing with your funding research? have you done any feasability study for a commercial scale enterprise. I saw the socal website very intresting.Making arrangements for a visit early 2010 to see this on a large scale commercial enterprise set up. Would love to hear more about the visit.. If you’re in Galway any time look us up for a chat. Would be delighted to hear more. Regarding our progress – we’re currently busy with work running up to Christmas and the New Year, with quite a lot on for the coming month so all occupied at the moment. Time is hard to come by to pursue the project fully but we’ll be expanding our feasability project in the new year. will keep you updated. see here for the forum etc..
Hi would it be possible to get contact details for Nigel as im very interested in setting up an aquaponic system in my back garden and im finding it very hard to get information on what is needed etc to get started also it would be great to talk to someone in Ireland currently using this system .